I love this for brunch or a winter cocktail party snack. The process picture above does not show the bacon, but I do believe that is the essential ingredient. Warm, smokey, sweet delight. This works really well to make ahead and finnish just as guests arrive. Preheat oven to 400*. Cut your bacon slices in half. Par cook so its still very flexible and flat and drain on towel. 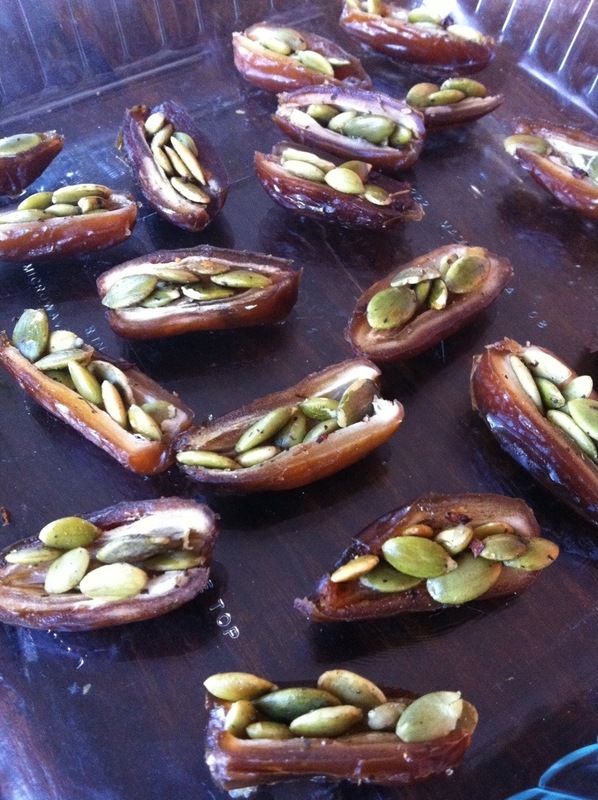 Halve your dates and pan roast some Papita (raw green pumpkin seeds) with a little salt and chili flakes. You could use an almond. Stuff each half date with as many seeds as fit in nicely, wrap with bacon. Line a pan with parchment paper and bake for about 15 minutes, or until bacon is browned and crispy. Stick a tooth pick in each one and dab on towel before putting on your serving platter. Two per person is a good estimate.